Help is on the way for one of the ugliest buildings in Brownstone Brooklyn, the half-demolished eyesore at 100 Clark St. in Brooklyn Heights. Newcastle Realty Services, which has owned the partly torn-down apartment building on the corner of Monroe Place since 2010, plans to begin rebuilding “as soon as permitted by the DOB,” meaning the city Department of Buildings, spokesman George Arzt told Eye on Real Estate. What has taken Newcastle – which paid $1.25 million for what’s left of the 1850s-vintage Greek Revival property in the Brooklyn Heights Historic District – so long to get started on the reconstruction? Newcastle, headed by developer Margaret Streicker Porres, received the blessing of the city Landmarks Preservation Commission for its renovation plan in 2011 and got partial approval from the Buildings Department in February 2013 to rebuild the property with five residential units. The apartments will likely be condos rather than rentals, Arzt said. But the Department of Environmental Protection said the building “had never been legally permitted for water” – and Newcastle had to get permits for water service for 100 Clark, Arzt said. Newcastle is now in the process of refiling for Buildings Department permits for water service, sprinklers and fire alarms, he added. Sources speculated that possibly another thing that slowed the rebuilding was the need to finalize settlements with three building tenants who had occupancy rights after 100 Clark’s partial demolition. The prior owner had drafted preliminary settlement papers for the rent-stabilized tenants, whose monthly rents were $550.68, $574.97 and $616.97, according to a memorandum prepared by brokerage Massey Knakal Realty Services and found online. Arzt said he can’t comment at this time about whether settlements with the tenants have been finalized. Neighborhood residents have been waiting for 100 Clark to be rescued since 2008 – when the Buildings Department decided to demolish it after a neighborhood resident reported that parts of the building were bowing out. The top two-and-a-half floors of the five-story property were torn down. “There’s a huge desire to see the situation addressed,” said Stephen Culhane, who owns the house next door. “A lot of people on the block and in the neighborhood are eager to see a renovation that reflects the character of the historic district. Newcastle bought 100 Clark after the Penson Cos. – on whose watch the building was partly demolished – lost the property to their lender. The asking price was $2 million, the Massey Knakal memorandum indicates. 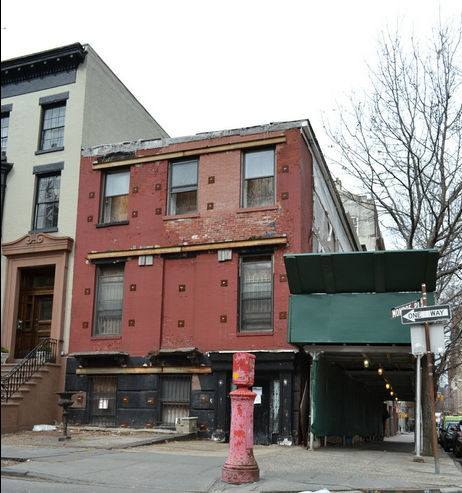 Design documents submitted to the Landmarks Preservation Commission also show that a concrete stoop and entrance stair will be constructed on the Monroe Place side of the building, reflecting the property’s original design. And a mansard roof that was a long-ago addition to 100 Clark will be recreated. Before Newcastle came along, the building was “unloved and unmaintained by previous owners” for at least two decades, said Judy Stanton, executive director of the Brooklyn Heights Association. Garbage was often dumped outside 100 Clark before the new owner hired a custodian to deal with the problem, said Stanton, who’s optimistic about Newcastle’s intentions. Newcastle restored a landmarked row of buildings in Greenwich Village whose facades partly collapsed – including a Prohibition-era speakeasy, Chumley’s, and a residential building, 84 Bedford St., where all nine condos quickly sold after it was rebuilt.